Effective this season, the first game of the NBA regular season begins on either the first Tuesday of November or the last Tuesday of October, and the last game on the third Wednesday of April. The NBA playoffs begin on the third Saturday of April. The 2000 NBA All-Star Game held in Oakland, California. The West won 137–126. Tim Duncan from the San Antonio Spurs and Shaquille O'Neal from the Los Angeles Lakers shared the game's MVP honors. The Slam Dunk Contest returned after a two-year absence, with Vince Carter winning the title in what is considered to be one of the best Dunk Contest performances of all time. Both the Los Angeles Lakers and the Los Angeles Clippers played their first games at the Staples Center. The Lakers would also go on to win 19 consecutive games between February 4, 2000, and March 16, 2000, the sixth-longest winning streak in NBA history. Staples Center's first season saw its tenants at two opposite ends of the league: the Lakers finished with a best regular season record of 67–15 and the NBA title, while the Clippers finished 15–67, the worst of the season. The Denver Nuggets played their first game at the Pepsi Center. The Indiana Pacers played their first game at the Conseco Fieldhouse (now Bankers Life Fieldhouse). The Indiana Pacers advanced to the NBA Finals for the first time in franchise history. 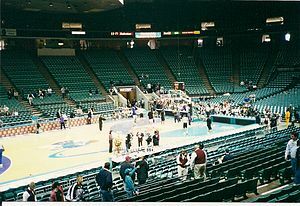 The Atlanta Hawks played their first game at the Philips Arena. The Miami Heat started the season playing their home games at Miami Arena. In January, they played their first game at the AmericanAirlines Arena. The Toronto Raptors played their first full season at the Air Canada Centre. They also made the playoffs for the first time becoming the first Canadian team to do so. During Game 7 of the Western Conference Finals, the Portland Trail Blazers held a 75-60 lead over the Los Angeles Lakers with 10:28 left to play. During the fourth quarter, the Blazers would miss thirteen consecutive shots, allowing the Lakers to claw back and take the game, 89–84. The game was capped off with a famous alley-oop to Shaquille O'Neal from Kobe Bryant. Two active players were killed in automobile accidents within four months of each other. On January 12, Bobby Phills of the Charlotte Hornets was killed as a result of reckless driving while racing against teammate David Wesley. On May 20, Malik Sealy of the Minnesota Timberwolves was driving home from a birthday party being held for Kevin Garnett when his SUV was struck by a drunk driver who had been driving on the wrong side of the road. Phills would have his jersey retired during the season after news of his unexpected death was announced, while Sealy would have his jersey retired after this season concluded. San Antonio Spurs forward Sean Elliott was sidelined for most of the season while undergoing kidney transplant operations. He successfully returned on March 13, becoming the first player to return following kidney transplant. 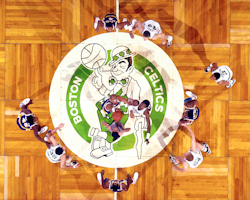 The Boston Celtics officially retired their trademark parquet floor on December 22, 1999, after 54 years. The floor would be replaced by a replica combining elements of the old floor and new wooden sections. The season marked Patrick Ewing's last in a New York Knicks uniform. He was traded during the 2000 offseason to the Seattle SuperSonics in a three-team deal. Hall of Famer Wilt Chamberlain died on October 12, 1999, at 63. Wilt's former teams, the Lakers, Sixers, and Warriors honored him by sporting black patches for the rest of the season. Kevin Johnson returned from retirement to replace the injured Jason Kidd of Phoenix Suns in this season's playoffs, but the Suns fell to the Lakers in the second round and Johnson would retire again. 36-year-old Houston Rockets forward Charles Barkley suffered a devastating injury early in the season but returned for a final game before retiring. The Atlanta Hawks moved into the Philips Arena and changed their uniforms. The Cleveland Cavaliers changed their uniforms, removing the blue areas from their jerseys. The Denver Nuggets moved into the Pepsi Center. The Detroit Pistons added new maroon alternate uniforms. The Indiana Pacers moved into the Conseco Fieldhouse. The Los Angeles Clippers and Los Angeles Lakers both moved into the Staples Center, while the Lakers changed their uniforms. The Miami Heat changed their logo and uniforms, and moved into the AmericanAirlines Arena in January. The Philadelphia 76ers added new blue alternate uniforms. The Seattle SuperSonics added new red alternate uniforms. The Toronto Raptors changed their uniforms removing the pinstripes. The 2000–01 NBA season was the 76ers 52nd season in the National Basketball Association, and 38th season in Philadelphia. Allen Iverson had his best season in 2001—he led his team to win their first ten games, he started and won All-Star MVP honors at the All Star Game. The Sixers also posted a 56–26 record, which was best in the Eastern Conference that season. It was the 76ers' best regular season record since 1984–85. Iverson averaged a then-career high 31.1 points, winning his second NBA scoring title in the process. He also won the NBA steals title at 2.5 per game. Iverson was named NBA Most Valuable Player for his accomplishments, beating Tim Duncan and Shaquille O'Neal by a wide margin. In addition, coach Larry Brown was named NBA Coach of the Year, Dikembe Mutombo won his fourth NBA Defensive Player of the Year Award, and Aaron McKie won the NBA Sixth Man of the Year Award.